Yay! 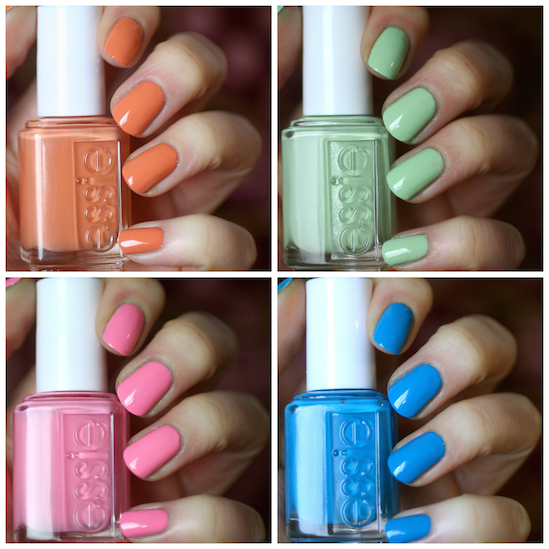 The Essie Resort 2016 Collection is finally here! I was soooo looking forward to this collection and anticipating my fave online stores to get them in (which is usually a couple weeks before they arrive in stores). They arrived a few days ago and I did a little unboxing right there in my van on Snapchat after picking them up from the mail box. I'm loving this collection being based on India. I actually went to India in 2011 to bring milk and food to children in slum schools and orphanages around Delhi. We also visited the Taj Mahal in Agra. What an amazing place! I brought back these little jewellery boxes for my daughters that I bought in a market in Delhi, along with some darling traditional dresses, so I was excited to use those things in the background of these photos. I took photos with both of my daughter's dresses and ultimately decided to use this deep raspberry and gold patterned tunic as my background. It was given to me by a young woman who attended a sewing school. The school's purpose was to provide the girls with real-life skills they could use to provide for their families so they wouldn't have to live in poverty. She was graduating and I was there for the ceremony and she presented me with this beautiful tunic/dress she had made herself. What an incredible gift! 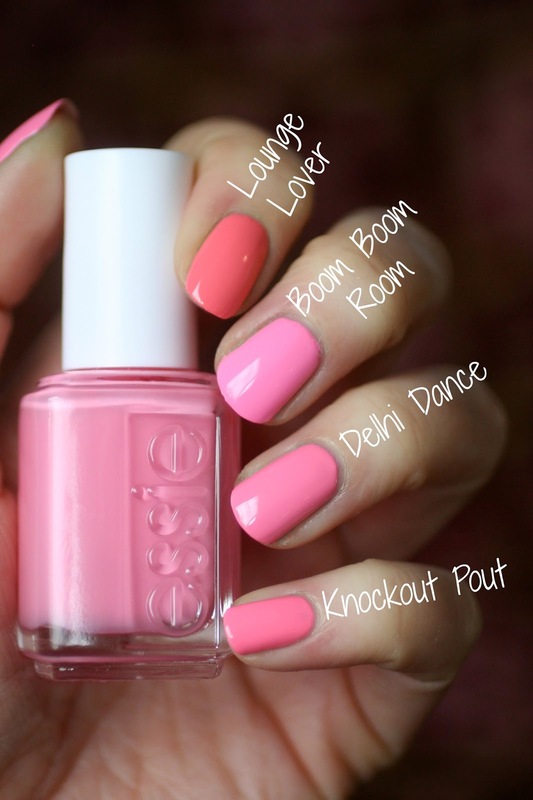 Anyways, India is close to my heart and I just love the names of these polishes. The colours are also spot on. My oldest daughter's dress is the colour of the green polish Going Guru and my younger daughter's dress is a deep rusty orange colour like Taj-Ma-Haul. Let's take a look at the formulas and do some comparisons, shall we? The colour of this one surprised me the most when I opened the box. I was expecting a really vibrant light lime green like Vibrant Vibes, but it's much much paler, more like Fashion Playground. The formula was okay but could have been better. It was streaky on the first coat but seemed to mostly even out on the second. I had spots on my nail that were thinner and also areas that needed smoothing because it didn't completely self-level, so I added topcoat. This is 2 coats of polish plus Good to Go top coat, but some nails could have used a 3rd coat. Going Guru is quite unique in my collection. It has the same paleness and colour pigmentation as Fashion Playground but way more of a lime green colour. Vibrant Vibes is quite different and much more intense in colour. Absolutely Shore is even paler still. This is a pretty, bright pink the colour of an Indian sari. 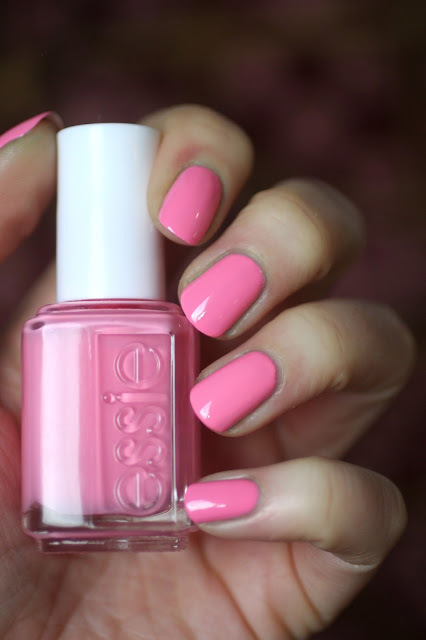 The formula was nice and opaque and pretty easy to apply. This is 2 coats. The only issue I had was that it didn't want to completely self-level, so I definitely needed top coat to smooth it all out. It wasn't bad and I still got a beautiful finish, just worth mentioning. Delhi Dance isn't a super unique pink. I didn't find anything exactly like it, but I did find some pinks that were close. I thought you might like to see how it compared to the bright pink from the new Spring 2016 Collection called Lounge Lover but as you can see it's a deeper shade and much more coral. Boom Boom Room is a cooler pink tone and Knockout Pout is close, but not exact. I thought about showing Groove Is In the Heart as well, but it was quite a bit lighter. 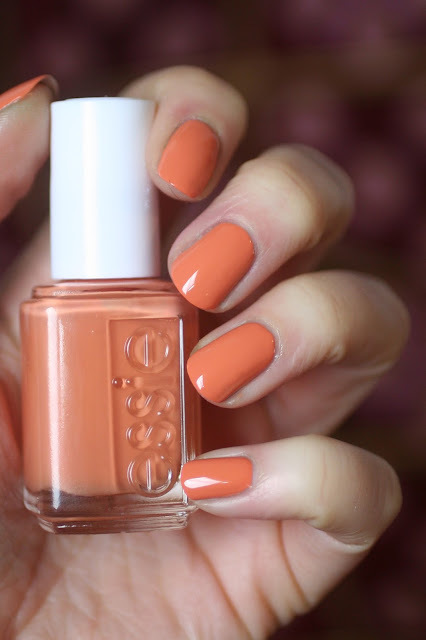 This is a dusty burnt apricot shade of orange and has a really great formula. It was almost opaque in one coat and easy to apply. It self-levelled really nicely and I didn't have to fiddle with application like I did with the previous two polishes. This is 2 coats. I know other nail polish bloggers have exclaimed this their favourite from the collection, but I'm not sure how I feel about the colour. I like that it's something different but I don't know if I love it on my nails. You know? Maybe it will have to grow on me. Taj-Ma-Haul is a very unique shade of orange! I didn't find anything quite like it. I thought Resort Fling would be close because I remembered it was quite a dusty cantaloupe colour, but it looks much brighter and more coral in comparison. 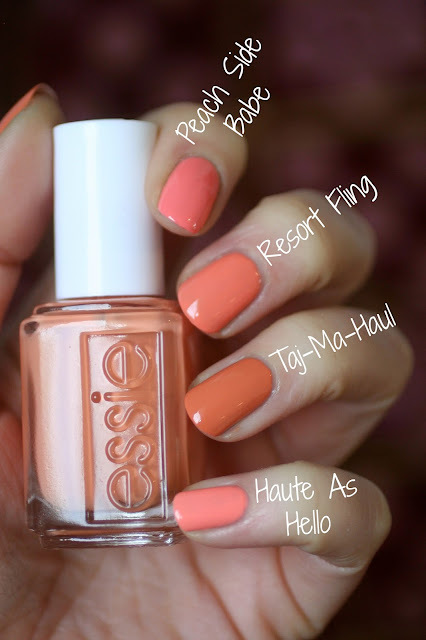 Peach Side Babe is even more pinky peach and Haute as Hello is a really bright light orange shade. Nama-Stay the Night is a medium bright blue creme. This one had an amazing formula! It was opaque in one coat but I did 2 for the photos. It self-levels really nicely as well. Umm...so this is not a unique shade of blue. 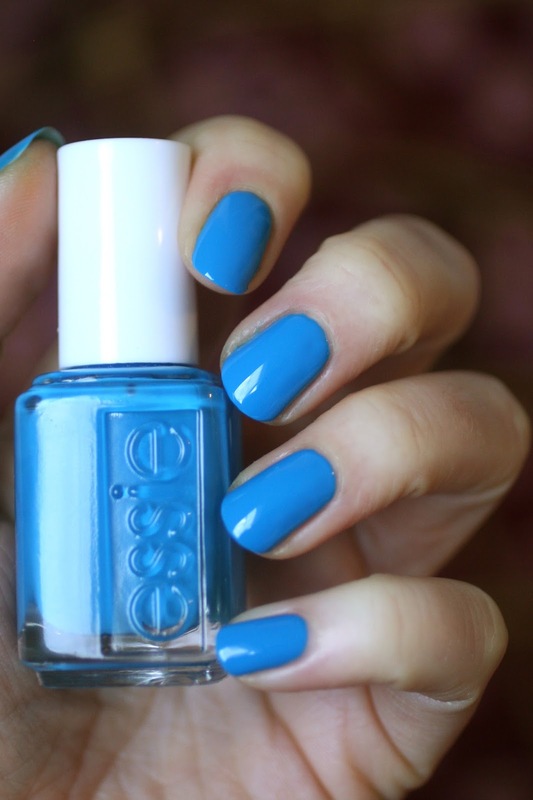 Essie's done it before. None of these are exactly the same but they are extremely close. 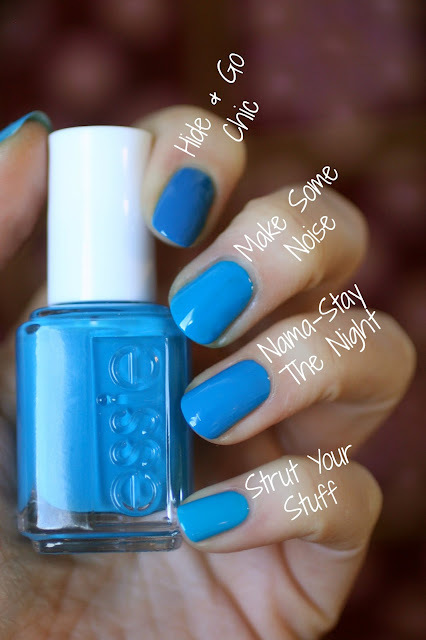 While Hide & Go Chic looks the most different, it's actually the exact same shade of blue as Nama-Stay The Night just a bit darker. Make Some Noise and Strut Your Stuff are a slightly different blue, more like a sky blue. But they are so incredibly close that I don't think you need Nama-Stay The Night if you have either Make Some Noise or Strut Your Stuff. My favourite from this collection is Going Guru, purely because that's the one I foresee myself wearing a lot this Spring. I hoped for a lot more from the formula though. It reminds me a bit of Bikini So Teeny and I'm praying I don't end up in a love/hate relationship with it (love the colour but hate the formula). Delhi Dance and Nama-Stay The Night are pretty with good formulas if you are missing a colour like that in your collection, but they aren't unique otherwise. Taj-Ma-Haul has a fantastic formula, so if that colour is speaking to you then it's worth getting! But I wouldn't say you need to jump on the band wagon just because others say you need it. I actually kept seeing swatches of that polish online and would go "Ugh. It's actually kinda ugly, I don't think I really like it" but because other nail polish bloggers would swatch it and say how amazing it was and how it was their favourite, I actually expected to put this polish on and have it magically be something that I loved and looked incredible. But I put it on and was like "Hmmm. I still don't know if I like the look of this or not." I showed it to my friend Austrian and said "is this ugly? Or pretty?" We weren't quite sure, so take that however you want to! Haha. I'm just saying (in a really long winded way) that if you look at the colour and love it, then you should totally get it because the formula is awesome and colour is unique. It may be a colour that down the line, next Fall or something, that my opinion shifts to it being a totally pretty colour but right now I'm on the fence. What do you think of this collection? Any colours standing out as your favourite? Beautiful review and swatches. My favourite is Going Guru, because I'm simply a sucker for light greens, especially during spring. Except Taj-Ma-Haul (which I don't like) I have lot of very similar colours already, so I think I'll pass on this collection. But overall I like it. I loved the orange color when I just saw it so I am glad it's a good formula! I also don't have any colors like Namastay-the-Night or Delhi Dance so might be worth getting the whole collection! I love how Going Guru looks like too, and I always use Good to Go as my top coat so I think I'll be good despite the formula concerns you've mentioned. Thanks for the review and comparisons! Just a note that Ulta in the US had this collection at 50% off at $4.25 USD! I don't know if this is an error or not, but I ended up buying all of them because of the price! Oh wow! Going Guru is not as similar to Vibrant Vibes as I thought it would be...thank you so much for that comparison, it helps a lot! Definitely going to try and get that colour then! The others I'm mehhh about, plus I've already got very similar colours to Nama-Stay The Night and Delhi Dance in my collection already, so not worth it. Very curious how Going Guru compares to the new greener version on MCA? Would you say bottle shot wise they are similar? I've been waiting until summer to buy Make Some Noise, Nama-Stay The Night is so close, but I think I still prefer Make Some Noise. It's sooo subtle, but I think I can tell the difference. I love Taj ma haul. What a great Orange! I have resort Fling but I've always wanted it to be oranger. Melissa - they are kinda sorta similar in that they are the same light/brightness but Going Guru is much more of a lime shade whereas MCA is very slightly bluey green. Alison - I always wanted Resort Fling to be more opaque! Mine takes about 4 coats to get opaque...yeeesh! I see now that Going Guru is very different from Fashion Playground! I think I will pick it up after all. 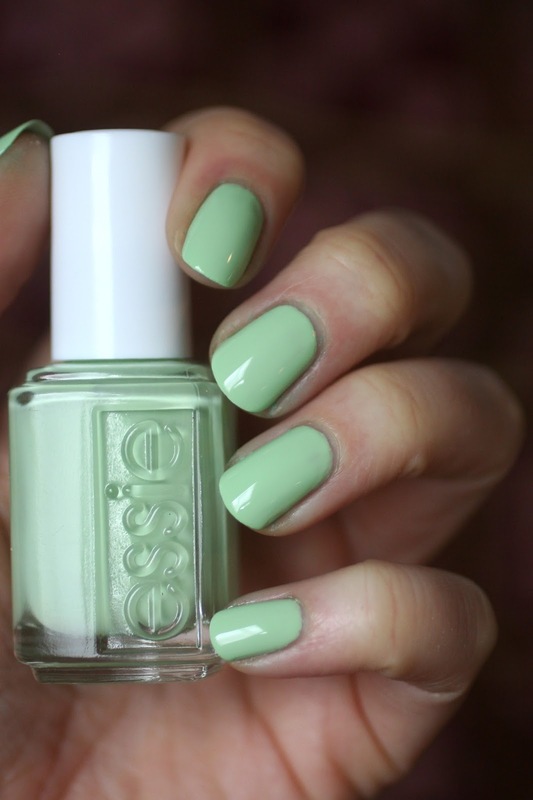 Such a lovely shade.